Use a pot with a tight fitting lid. Heat the oil, curry powder and cayenne pepper over low heat for 1 minute. It'll turn into a nice fragrant paste. Don't let it burn though! Raise heat to medium and stir in onion and garlic. Cook for 7-10 minutes. Add chicken, salt and pepper, cook for another 10 minutes or until chicken is cooked through. 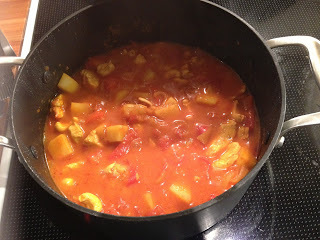 Add potatoes, bell pepper, coconut milk, tomatoes, tomato sauce and sugar. Stir and leave to simmer under lid for 30 minutes. Add a handful of cashew nuts and leave to simmer for another 10-15 minutes. Serve with rice, or by itself in bowls. ABSOLUTELY delicious! I think this may be my new favourite food. I literally sighed "Yuuuummm" out loud as I took the first bite.